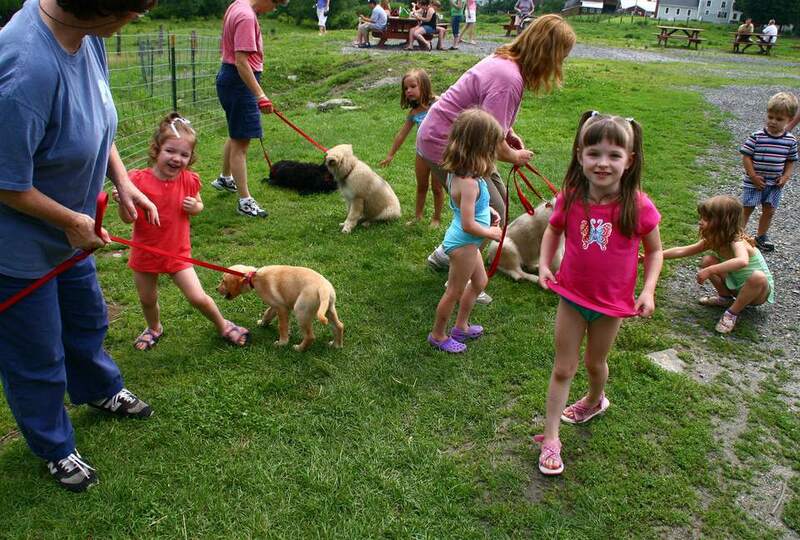 To be good pets, puppies require early age socialization. That’s a fancy way of describing how they learn to interact in a positive way with the world around them. Dogs can be trained at any age, and continue to learn throughout their lives. But the prime socialization period is a narrow window during babyhood when learning the “wrong” lessons can emotionally cripple the puppy. Dogs not exposed to positive experiences with humans, other pets, important places and situations during this period may become fearful and bite out of fright. Proper socialization develops canine social and communication skills. Socialization also teaches puppies what’s safe, normal and acceptable. Anything the puppy doesn’t learn about during socialization could potentially be considered dangerous, to be feared or even attacked. Puppies are most receptive during a six-to-eight week window, but your dog benefits from socialization exercises for the first year. During the early weeks, mother animals teach many lessons by example. For instance, if Mom-Dog becomes hysterical around men, her pups pay attention and copy her behavior. People raising litters must begin positive lessons before the babies go to new homes. Consider this as kindergarten for pups. Youngsters have an increased capacity for learning when they’re young, so it’s helpful for new owners to continue these lessons after adopting a pup. Even after your little guy becomes a grown-up dog, regular practice sessions help remind him that the mailman is actually a good guy even if he wears a funny hat. How do you create kindergarten for pups? Create a checklist of all the experiences your puppy will face during the first several months living with you. And then systematically introduce her to each situation, while associating it with fun, happy benefits for the puppy. For example, handle her paws to help her learn to accept nail trims. Ring the doorbell, and offer a squeaky toy so she associates the sound and guests with rewards. Here are 10 broad categories of situations you can expect your new puppy to deal with. Handling the puppy’s paws, ears, mouth, eyes, and tail simply feels good. It’s also a great way to prepare your pup to calmly accept vet exams. Owner’s homes are different so add your specifics to the list. In most cases, puppies will live with occasional delivery or repair people entering the house, the phone and doorbell ringing, guests (strangers) arriving, sweeping/mopping/vacuuming, the noise of the washer/dryer and dishwasher, and loud TV shows or music. People come in different ages, genders, and ethnicities. Puppies won’t necessarily accept all humans in the same way. Those raised in shelters by only women need help accepting men. Children—especially babies and toddlers—look, smell, sound and move differently. What people wear, carry or how they move also changes a puppy’s perceptions, so socialize the baby to uniforms, raincoats, hats, sunglasses, bearded men and even people with shaved heads, or strong perfume if that’s appropriate. What people carry or how they move also can surprise and frighten pups. Those destined for therapy work especially benefit from being socialized to people using canes, crutches, legs in a cast, walkers, wheelchairs, baby carriages, backpacks, or erratic body movement. Don’t neglect athletes and their equipment, including joggers, skateboarders, bicyclists, tricycles, or roller bladders. Animals also can frighten, intrigue, or prompt attacks. Even if your puppy will be an only pet, it’s important to socialize him to other puppies and adult dogs, kittens and cats especially if he’ll be living with them. Do you live in the country? Socialize to the livestock so you won’t have a pestering pup chasing the cows or chickens. Vehicles either enrapture or terrify dogs. Your pup will need to make trips in the car, but don’t neglect other experiences. Let him get used to trucks backing up, garbage trucks, motorcycles, or any other vehicle he might encounter. Noises and weather can upset many pups. You can counteract much of this with socialization. Associate sirens, thunder/lightening, snow blowers, snow, rain, fireworks, people yelling and other unexpected noises with a favorite treat, toy, or attention. Yard equipment can be scary, too. Pups not used to a garden rake might think you plan to hit with the stick. Get your baby used to shovels, the garden hose, sweeping with a broom, wheelbarrows, lawn mowers or other yard equipment. New surfaces can seem scary if a pup has never before seen the ice, for instance. Dogs raised in kennels may not know how to pee on grass, or act frightened of dirt or gravel. Be sure your pup has practice walking on all kinds of surfaces including cement, sand, wooden decks, carpet, and learns how to climb up and down stairs. Environments come in all shapes and sizes. Each new place could potentially be scary, so take your time but be sure your pup has experience with the important ones. That may include car rides, the vet clinic, boarding kennel, groomers, gas station, the bank, friend’s homes, pet supply store, school grounds, car wash, walks after dark, crossing a bridge or busy intersection, drive-thru, crowd of people, the beach, hiking trails, or the office.